Sorry ! Registration for Dell Dhamaka Offer 2019 got closed on 09 Feb 2019. By participating in the Offer, you acknowledge and agree to the T&Cs related to the Offer. 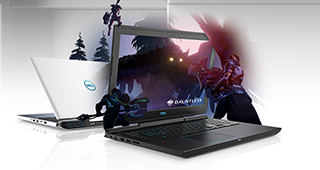 The DELL DHAMAKA OFFER 2019 is being offered by Dell India for customer’s purchase of only Inspiron 3576, Inspiron 5570, Inspiron 7373, Inspiron7570 in India through the authorized Dell Outlets having a valid SA Code. Post approval expediency fee of Rs.99/- needs to be paid for each approved system within 7 calendar days from the date of approval. Multiple Vouchers of any value from multiple Brands can be redeemed, subject to a total of the earned reward points. Please note that voucher will be delivered within 48 working hours. 2000 reward points for every approved Notebook. Log on to www.delldhamakaoffer.com and register as per the above stipulated guidelines to avail the offer. Post registration validation eligible participant shall receive registration approval intimation on their registered email and SMS within 7 days from the date of registration. All customer queries regarding document submission or the offer, please reach delldhamakaoffer@gyftr.com or contact 1800-103-3312 toll Free Number (Monday- Saturday 10 AM till 6 PM). Offer Period- 12th January 2019 to 2nd February 2019. Registration to be completed within 7 calendar days from the date of purchase. Purchases made on 2nd February 2019 are required to register on or before 09th February 2019. Please Contact Shop manager for any acceptance issue and if issue is still not resolved you can write in to help@gyftr.com /18004199150 for immediate help. Any dispute should be referred to the company from where the voucher has been received, decision of the TITAN shall be final. This is a Bata Insta Gift Voucher (GV) / Gift Card (GC) and would be accepted at listed outlets. For Outlet List, please visit www.gyftr.com/bata. The GV / GC cannot be used at Cafes / Food Courts within Lifestyle. The person who has the Lifestyle GV / GC Code is deemed to be the beneficiary. Only the listed Lifestyle outlets at its sole discretion accept the GV / GC. Lifestyle may add or remove an outlet without giving any prior notice. Lifestyle GV / GC CANNOT be revalidated once expired. Lifestyle GV / GC can be used during sale. Lifestyle makes full efforts to accept Insta Gift Vouchers (GV) / Gift Card (GC), but on account of any technical / administrative reasons an outlet may refuse to accept the same. E Gift voucher is redeemable for merchandise at Shoppers Stop, Shoppers Stop Airport Stores, Home Stop within India. Purchase of Mobiles, Mobile Phone Accessories, Cameras, mp3 players, laptops, 22K & 24K Gold Jewelry& Gold Coins of any Jewelry brand is not allowed through this E Gift Voucher. E Gift Voucher cannot be reloaded. The minimum validity of the E Gift Voucher is 6 months from its date of issue. Partial redemption of E GV shall not be allowed at the store, only a credit note shall be issued for the balance amount in case of part utilization of EGV. If the E Gift Voucher is lost or stolen, neither will a new E Gift Voucher will be issued nor will the money be reimbursed in any manner. Shoppers Stop Limited shall not be liable and responsible for any unauthorized and/or fraudulent purchases made using this E Gift Voucher. The holder of this E Gift Voucher shall be solely liable. No duplicate E Gift Voucher will be issued. E Gift Voucher is property of Shoppers Stop Limited to whom it should be returned on request. Disputes subject to Mumbai jurisdiction. This Voucher is valid only for the purchase of Tanishq Products from authorized Tanishq showrooms. This Voucher is only entitled to a credit to the extent of the face value of the voucher. If the value of the purchase is less than the value of the Voucher, the balance is non-refundable. This Voucher is valid only the month and year mentioned on the Voucher. No replacement or compensation is permissible for lost or mutilated or defaced Voucher. Voucher can be combined with other ongoing offers at Tanishq stores. These EGVs are valid for 12 months from the date of issue. (Validity date will be mentioned). These EGVs are valid for booking on – Flights (Domestic/International), Hotels/ Buses (Domestic), Holidays (Domestic/International) only at Yatra.com. EGVs are valid for ONE time transaction only. EGVs can be used Online for booking of Flights (domestic/international), Hotels (domestic) &Buses (domestic) individually. Buses (domestic) can be redeemed online only. Holidays (domestic/international) can be redeemed offline only by calling 0124 – 3040707 / 700 between 10AM to 7PM (all seven days). User has to apply / quote the unique EGV number at the time of booking to avail the benefits. No additional Discount / reduction in the price will be entertained other than the offer mentioned on the EGVs. If a purchase is less than the value of the EGV, then customer can avail the discount maximum up to the value of the purchase only. Balance EGV amount will be forfeited and customer will have to pay Re.1 to complete the transaction. If a purchase is equal to the value of the EGV, then customer will have to pay Re.1 to complete the transaction. If a purchase is more than the value of the EGV, then balance amount can be paid through Net Banking, card (debit/credit cards), Mobile Wallet or Consumer can pay balance amount through another EGV through offline mode of redemption only (in case Consumer has more than one EGV) e.g. if Consumer wishes to redeem an EGV against the booking of Rs. 5,500 then he can use a Rs. 5,000/- EGV and the balance amount of Rs. 500/- can be paid by Net Banking/card/ Mobile Wallet or by using another EGV (through offline mode of redemption). In case of cancellations, EGV amount will not be refunded back to the customer. Myntra E- Gift Card is issued by QwikCilver Solutions Pvt. Ltd which is a private limited company incorporated under the laws of India, and is authorized by the Reserve Bank of India ("RBI") to issue such Gift Cards. This E-Gift Card is redeemable only on Myntra marketplace platform. This E-Gift Card shall have a minimum validity period of 6 months. This E - Gift Card cannot be used to purchase other gift cards. Multiple E- Gift Cards cannot be clubbed in a single order. E -Gift Cards cannot be redeemed for Cash or Credit and cannot be reloaded. This E-Gift Card can be redeemed online against sellers listed on www.myntra.com or Myntra Mobile App only. In cases where the order is cancelled, the E- Gift Card amount shall be refunded to the source E-Gift Card. The balance amount, if any, of the cost of the item being purchased by the Customer, after the discount has been availed, will have to be paid by the Customer at the time of purchase. If the order value exceeds the E -Gift Card amount, the balance must be paid by Credit Card/Debit Card/Internet Banking/Cash on Delivery. If the order value is less than the amount of the E - Gift Card, the outstanding balance (after deduction of order value) will reflect under the same E -Gift Card and can be used for subsequent transactions. For individual retail customers E - Gift Cards can be purchased on www.myntra.com or Myntra Mobile App using the following payment modes only - Credit Card, Debit Card and Net Banking. You are solely responsible for the safety and security of the E -Gift Cards. myntra.com/QwikCilver Solutions are not responsible for any acts of omission or commission if Gift Card is lost, stolen or used without permission. Once the E - Gift Card has been sent to the customer, then the customers are bound to protect the E-Gift Card PIN or E -Gift Card number. In the event of any misuse of E -Gift Card due to loss of any such confidential details due to the fault of the purchaser/customer, myntra.com/ QwikCilver Solutions Pvt. Ltd shall not be held responsible for the same and no refund can be issued against such E -Gift Cards. .
Myntra.com/QwikCilver Solutions assume no responsibility for the products purchased using the E - Gift Card and any liability thereof is expressly disclaimed. Product warranty shall be regulated by the terms and conditions mentioned on the warranty card of respective products. Validity of E - Gift Card cannot be extended, new E - Gift Card cannot be provided against the expired/unused E - Gift Cards. 18.
fraudulent means and/or the beneficiary/Know Your Customer ("KYC") details as per RBI Guidelines are found to be incorrect/insufficient. In such cases, the funds shall be credited back to the same source from where these were received. You agree and understand that E - Gift Cards are a pre-paid payment Instrument subjected to regulations by RBI Under the RBI guidelines, Myntra/ QwikCilver Solutions Pvt. Ltd may be required to share KYC details of the purchaser/ redeemer of the Gift Card and/or any other information with relation to the purchase of the Gift Cards and/or transaction undertaken using the Gift Card with RBI or such statutory authorities. Myntra/ QwikCilver Solutions Pvt. Ltd may contact the purchaser/redeemer of the GC for any such information. Myntra along with its sellers reserves the right to change the terms and conditions of the E-Gift Card. The person who has the Kalyan Jewellers GV Code is deemed to be the beneficiary. Only the listed Kalyan Jewellers outlets at its sole discretion accept the GV. Kalyan Jewellers may add or remove an outlet without giving any prior notice. More than one GV can be used in one bill. Kalyan Jewellers Insta Gift Voucher (GV) / Gift Card CANNOT be revalidated once expired. Kalyan Jewellers Insta Gift Voucher (GV) / Gift Card can be used during sale. Any dispute related to the Insta Gift Voucher (GV) should be referred to the issuing company and the decision of the issuing company shall be final. Kalyan Jewellers makes full efforts to accept Instant Gift Voucher (GV) / Gift Card, but on account of any technical / administrative reasons an outlet may refuse to accept the same. Kalyan Jewellers Gold Coin Insta Gift Voucher (GV) / Gift Card can only be used to purchase Gold Coins. Kalyan Jewellers Gold Jewellery Insta Gift Voucher (GV) / Gift Card can only be used to purchase Gold Jewellery. Kalyan Jewellers Diamond Jewellery Insta Gift Voucher (GV) / Gift Card can only be used to purchase Diamond Jewellery. If an Instant Gift Voucher (GV) / Gift Card get blocked on account of technical issue, it would get enabled in 72 hours. Dell reserves the right to add/modify/delete these terms & conditions without any prior notice and the same shall come into force with immediate effect. Above models also eligible for BFL 16/4 scheme also. Dell Dhamaka Offer 2019 is being offered by Dell India for customer’s purchase of only Inspiron 3576, Inspiron 5570, Inspiron 7373, Inspiron 7570 in India through the authorized Dell Outlets having a valid SA Code. • Customer will need to submit a scanned copy of invoice as a proof of purchase and a scanned copy of an ID proof because some states regulations require this for us to ship products. • Customer will get a Registration Reference Number. Customer has to use reference number for all future communication. Q. Is mobile number & email address mandatory? Yes, mobile number & email address is mandatory. All program communication will be sent to the registered mobile number and email id. Q. What if model number is not in the list of the drop down? All valid model number are part of the drop down, please recheck the same. As per the program T& C , customer has to register his claim within 7 days of purchase. Therefore the calendar is showing 7 days period for registration. Please write in to delldhamakaoffer@gyftr.com for any query. Q. What if I upload the wrong invoice by mistake? If wrong invoice is uploaded the claim will get rejected. Customer has to re register for the same claim. A customer can register only twice in the program. Q. What if I don’t have the invoice? In case there’s NO or wrong invoice uploaded, claim will be rejected. Q. When does my registration get valid? Once you submit the claim with all details and invoice copy, claim will be validated at the backend. If claim is rejected intimation will be sent to registered mobile number along with the reason of rejection. TAT for claim to be validated is 7 days from the date of registration. Q. Can I check the status of my claim and Goodies? Yes, you can check real time update of your claim by login on the status page using registration reference number generated at the time of registration. The reference number will be key identifier for all program related queries/issues. Q. Where can I call if I have a query? © 2018 Dell Inc. All rights reserved.